Destinations : DELHI – PATNA- RAJGIR – BODHGAYA – VARANASI – SARANATH – KUSHINAHGAR – LUMBINI – SRASVATI – BALRAMPUR – LUCKNOW. After breakfast, tour the historic city of old Delhi to include the magnificent Red Fort, Jama Masjid, largest mosque in Asia, both built by Shahjahan, Rajghat-memorial to Mahatma Gandhi, the “Father of the Nation”. Afternoon, tour of New Delhi to include Humanyun Tomb, Qutab Minar, India Gate, Birla Mandir, Bahai Temple. Overnight at hotel. Depart for airport for early morning flight to 2500 year old ancient city of Patna. On arrival at Patna transfer to hotel. Afternoon excursion to Vaishali where Lord Buddha preached his last sermon announcing his approaching Nirvana. Visit stupas holding urns containing ashes of Buddha and Ashoka pillar erected by Emperor Ashoka to mark places sanctified by Buddha. The place is also known now for famous Madhubani paintings. Overnight at hotel. Morning drive down to Rajgir (102 kms / 2 hrs & 30 mins) capital of 6th century Magadha empire. It was revered site of Buddha’s discourses. Buddha spent many years here. Visit Gridhrakula, Sapataparni cave, Ajatsatru fort and Venuvana. Afternoon visit Nalanda – the world’s oldest university founded in the 5th century. Also visit monasteries and temples with impressive Buddhist & Hindu images. The Institute for research into Buddhism and Pali literature which houses rare manuscripts, is also worth visiting for the enthusiasts. Archaeological museum is also not to be missed for the rare collections. Overnight at hotel. Early morning after breakfast depart for Bodhgaya (193 kms / 4 hrs & 30 mins) by road. En route visit Baraliar caves – the earliest examples of rock cut caves. Most impressive craftsmanship of carving and rock inspiration can be seen. These caves served as inspiration for the setting of E.M Foresters “A Passage to India”. Arrive Bodhgaya and overnight in the hotel. Bodhgaya is one of the holiest Buddhist pilgrimage centres. It was here that Gautama attained enlightenment and became Buddha under the “Bodhi” tree Satabodhi temple, Japanese and Tibetan monasteries along with Magadha university museum are also to be visited. Overnight at hotel. 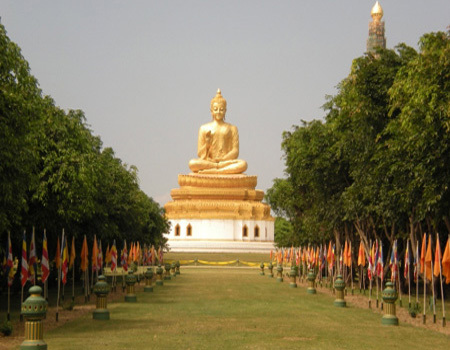 Afternoon drive to Kushinagar – the place where Buddha passed into Parinirvana. Visit Ramabha stupa which stands on the spot where the body of the Lord was cremated. 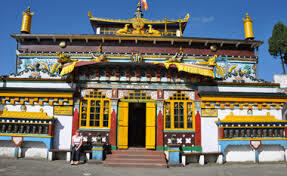 Also visit Natha Kumarka Kot enshrining the large recumbent figure of Buddha in the state of Nirvana. Overnight at hotel.